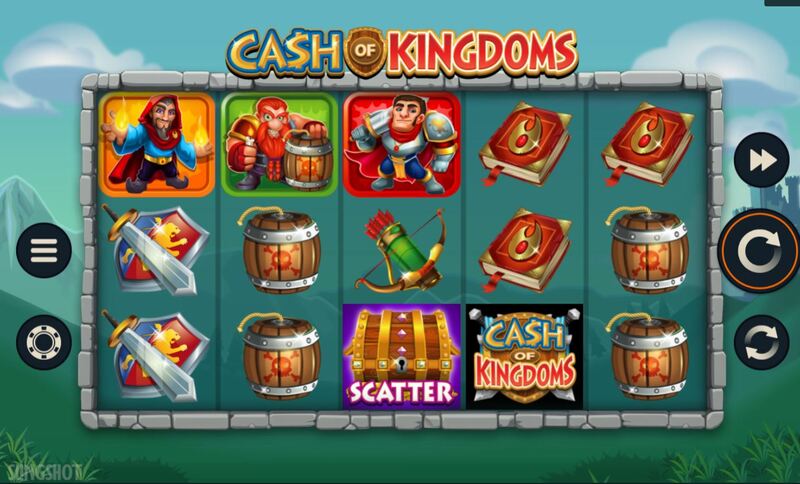 Cash of Kingdoms slot like several Microgaming editions such as Dark Red and Monster Wheels was created by an in-house developer, in this case Slingshot. 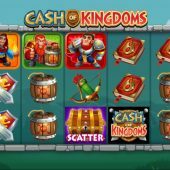 These games tend to be pretty hit-and-miss and add little of interest to Microgaming's vast portfolio and I'm afraid Cash of Kingdoms is no exception. The theme is of cartoon medieval characters with the reels over a background of a castle nestled in the countryside and some gentle music as we spin which reaches a comedic crescendo when a win appears. Pretty abysmal so far on the eyes and ears I must say and already I see little chance of any cash from this kingdom coming the way of our bankroll. The game consists of 5 reels and 3 rows and there are 15 pay lines which work on a both-ways-pay basis so you will win from right-to-left too. Symbols are stacked and the pays are quite low which is an indicator of the ruinously low volatility here. The Knight pays 10x bet for a 5-of-a-kind, Wizard 8x, Archer 7x, Red Beard 6x and Girl Robber 5x. The five other icons are low pays and consist of a Shield, Book, Quiver, Barrel and Coin Bag which pay 35 down to 20-coins each for your 15-coin bet. You will see Wilds in the typical Microgaming Gold and Red logo lettering only on reels 2,3 and 4. On reels 2 and 4 they are stacked though which is actually an in-play feature as we'll see. If a full stack lands on either 2 or 4 the reel will 'invade' one of the adjacent reels, in other words it's a laterally-expanding Wild. If they both appear reel 3 will turn Wild thus giving you a giant 3x3 block in the centre and therein lies the only chance of a decent win here bearing in mind the game pays both ways. Seeing a Treasure Chest land on the centre 3 reels will award 10 free spins. There is little difference to the base game other than if you do see the Wilds on 2 and 4 which fill reel 3 and then give the 3x3 block, this spin will pay double. You will also get 1 extra spin for each scatter appearing but no retriggers. Should you achieve this block Wild with the best symbol stacked either side and the 2x multiplier applied you will hit the top pay of an incredible 300x bet. Brilliant.